Carrying out targeted marketing campaigns without a strong database in hand can be an uphill battle. Blue Mail Media is well positioned to help marketers with high quality marketing data to reach their clients in numerous industry verticals and regions. 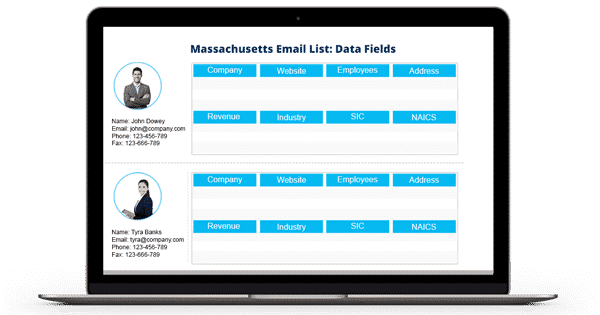 Our Massachusetts Business Executives Email Database helps you implement your multi-channel marketing campaigns flawlessly and improves your response rate, conversion rate and revenue significantly. Blue Mail Media holds a strong data repository of wide-ranging industries, C-Level executives, and professionals across Massachusetts. Over the years, Blue Mail Media has emerged as one of the top data marketing solutions providers in the US. Having a fair idea of clients’ challenges, we offer customized database that perfectly aligns with your campaign specific requirements. Our Massachusetts Business Database lets you connect with multi-channel marketing channels such as telephone, email or mail. For your immediate marketing requirements, you can avail our pre-packaged Massachusetts Business Email List. Alternatively, you can get your list customized based on multiple selects such as SIC/ NAICS code, job Role, scale of operations, staff size, amongst many others. Our Massachusetts Executives Email List offers you a competitive advantage in terms of expanding your business in Massachusetts.